The coming age of shmeat: lab-grown, cultured meat options on sale at your local supermarket or convenience store is nearing, making real food festivals like Meatopia resonate all the more — the festival's UK launch last weekend comes just a month after the world's first lab-grown burger was unveiled at a taste testing in London. 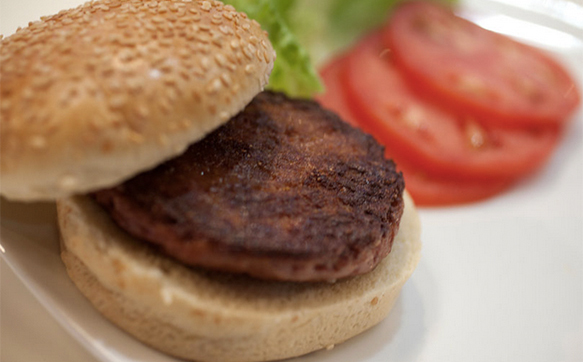 Are we ready to embrace a future eating lab grown meat? Attracting mainstream appeal from traditional meat eaters to progressive vegetarians won't be easy even if this venture is ultimately honorable: to solve one of the world's perennially perplexing agricultural problems: how do we create more meat for an ever-growing population without turning all our forests and arable land into pasture? Put aside for a moment the environmental rhetoric that will surely intensify in the coming years with western governments, animal rights activists and futurists like Google co-founder Sergey Brin clamouring to lead the charge against "traditional thinking" about what we eat, and let us consider some of the more pragmatic considerations. The naming issue. Is it meat? The name meat originally comes from 'mete' meaning food in general, but nowadays it is used to describe a food derived from an animal with flesh and blood. 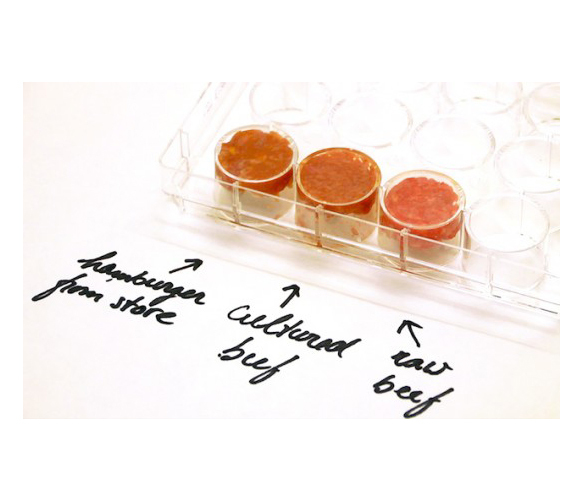 Is lab-grown meat still meat if it is grown from serum from the blood of unborn cows? Will a prefix qualifier such as cultured, in vitro, etc. be required to make the name legal under the Trades Descriptions Act? If so what will be the effect on consumer perception and branding? Currently speaking, ‘cultivated’ (or ‘cultured’) beats ‘in vitro’ which in turn tops ‘lab-grown’ or ‘test tube’ – however both ‘cultured’ and ‘cultivated’ have an elitist ring (as in ‘refined’ or ‘sophisticated’) are perversely ironic and make for easy ridicule. No wonder there is no officially recognised name as yet. Consumers are becoming more discerning in food choices – see our article differentiate or alientate – and in this search for purity in the wake of contamination, food producers and restaurateurs are being forced to open up their supply chain with a demonstration of transparency. The world’s most powerful fast food chain McDonalds with its FarmForward initiative (amongst others) is designed to restore trust but brand trust and trust in an industrial farming system are of course two very different matters. An opportunity exists in the marketing of in-vitro burgers to give consumers clearer product information about its origins from the name of the scientist to even the cow in which the stem cells emerged – and this can be achieved to varying degrees in-store, on-pack and on-line. The obvious downside though is that the stem-cell burger is already perceived as a ‘frankenfood’ and any branded communication will have to reassure not amplify consumer suspicions. To ease people into the concept of cultured meat, an intermediary product may have some virtue, especially if it appeals to early-adopter eco-conscious types. Trust formation is also helped by strong brand ambassadors chosen from different sectors of society. The question which needs to be answered is how to position cultured meat in a way that can be favourably interpreted in a multi-faith society? Whilst Hindus shun cultivated meat because its society considers the cow as sacred, experts need to agree on a name that makes the product permissible under Kosher and Halal dietary laws. Like BP used Beyond Petroleum as a tagline, the innovative food producer Beyond Meat and the non-profit research organisation New Harvest provokes consumers to engage in the ethical debate by promoting a future of opportunity rather than of scarcity. The packaging design by Beyond Meat is carefully constructed to ease consumers into their meatless world with friendly visual mimicry, positive taste-conjuring words and simple health-related messages. The pack design and branding of Beyond Meat also provides useful pointers for the cultured meat sector, helping new customers become familiar with a tasty substitute. Here the ethical card is not trumpeted – no factory farms and no killing – it is implied. Rather, the visual language and copywriting focuses on the health benefits of the protein rich food and an emphasis on the sensory properties (look, taste, feel). 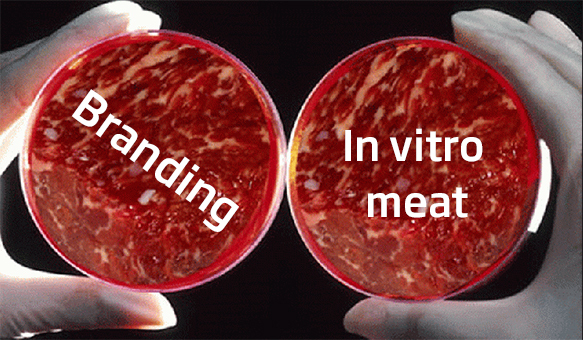 Appealing instantaneously by focusing on benefits and sensory experience requires strong brand imagery in the case of in-vitro meat. The frankenfood label, a misnomer commonly attached to it, is damaging not only to its desirability but also to the steady normalization of the food concept in the consumer's mind. What branding can do is to take negative connotations associated with 'lab-grown', and reframe it around a new way of eating and perceiving meat. If the in-vitro burger and the IVM category itself is to really catch on the focus will need to shift away from the lab. This will surely be one of the more interesting challenges for a design agency involved in food packaging, retail and identity creation.